How far should a man go to stand up for his ideas in the face of conventional standards? To hold onto his vision despite the many societal norms? To preserve his integrity and his ‘selfness’ at all cost? Well, if you ascribe to Ayn Rand’s philosophy of Objectivism, then there should be no doubt. According to Rand, it is the self which is the highest goal every single person should strive for, and everything else simply does not matter. 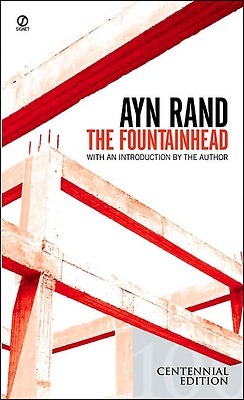 This basic idea form the foundation for the Fountainhead. It tells the story of Howard Roark, a young brilliant architect who is far ahead of his time. Roark is the epitome of what Rand depicts as ‘the ideal man,’* a man who stays true to himself despite all the obstacles society throws upon him. I actually hated Roark’s guts when I first started reading the book. Here is a man whose will is so unbending, who is so unwilling or, more accurately, unable to consider other people’s viewpoints and opinions, that it is hard to muster up a single gram of sympathy for him. But that is the whole point, right? Rand teaches us that Roark is not a man who seeks sympathy. And as I read further I started to gain, if not exactly sympathy, a great deal of respect and even admiration for him. You see, despite my own anxieties, despite my own tendency to care deeply about what others think, I am a staunch believer of Rand’s basic premise. Roark, in some crucial ways, represents the man who I would like to become.